Cultivars that reportedly exhibit good postharvest characteristics include ‘Cabernet CLP’ and ‘Melany’. Native from India to Malaya. Common relatives include mulberry, fig, osage-orange and hops. 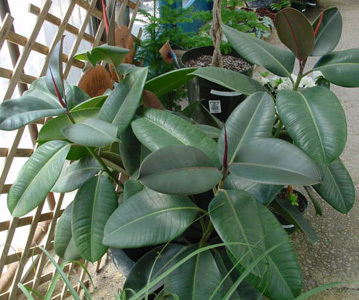 Leaves thick, glossy, leathery, up to 12 inches long and 6 inches wide. They can be green, reddish-green to variegated (green, white and/or creamy yellow). Chill sensitive, store at 55-60F. ‘Robusta’ can be stored about 5 degrees colder (50-60F). In fact, this cultivar can even tolerate 36-46F for up to 4 days and still be salable. The specific epithet name elastica means elastic, in reference to the milky, latex sap used to make rubber. A white latex material appears when stems and/or leaves are broken. Try to avoid such breakage as the latex can make a mess on floors, furniture and the like. Will generally grow well in light levels bright enough to read a newspaper in comfort but higher light levels are preferred. If light levels are to low, the common problem of twig dieback often develops. If grown in Florida, plants should have been produced under 50-60% shade. Grown under lower light levels, plants are better adapted for the commonly encountered lower light levels when placed indoors. Poole and Conover (1993) stored ‘Robusta’ at 36-46F from 1-4 days and subsequently noted small yellow striations on leaves within a few days but the plants were still salable.